Clarrix provides one of the easiest user interfaces available for video conferencing. You’re benefiting from a technology team that has been working with streaming video and video conferencing since 2004. Clarrix provides more than just a tool: we provide options our clients. Customized solutions that allow their companies to distinguish themselves from others through customized web interfaces and ever-improving technology. Video conferencing has a huge impact on business performance! 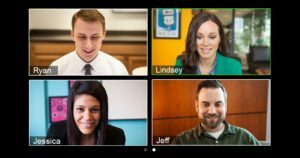 By integrating video conferencing throughout your organization, you can enjoy some or all of the following. Cut your travel expenses by 50% or more! Meet with team members, face-to-face, anywhere in the world with wifi! Meet with up to 200 individuals! Broadcast to thousands via our webinar service!